At first, refretting ﻿﻿a guitar by yourself can be overwhelming and might seem impossible. But with the right tools, following the right steps, with a little patience and concentration, an average guitar player can do it in his/her own home. I made this easy to use, step by step tutorial for the average guitar player. If you take your time and follow the instructions with focus in mind, you can too learn how to refret a guitar. You don’t necessarily need to invest a lot of money in tools or pay someone else to do it. Probably most of the tools and materials needed for this job are in your house anyway, so you will need to make little expenses to do this. How do I know my guitar needs refretting? When is refretting necessary? When you have an old used guitar with frets that are worn out by playing or when you want to build a guitar from scratch or want to replace the neck with a damaged one that needs refretting. The beat up frets might come out of their groove, giving you trouble when playing, making fret buzz, or interfering with the clear sound of the note they’re supposed to render when strumming. You can use a sand block to smoothen the board and even and smoothen the fret edges to a 90-degree angle. Refretting correctly is a precise job that requires patience, careful measuring and following several processes step by step. If the fretboard already has the grooves for the frets, all you have to do is place the new ones in the old grooves and glue them properly. There’s a lot of mathematical precision if you want to do this right but don’t be discouraged. With proper guidance and concentration, most guitarists can do this. You will want the frets to be the same in thickness, design and shape, so when replacing a few make sure they are the same as the rest of the frets you already have on your guitar. This will keep good note intonation, avoid mute chords, fret buzz, or making your guitar sound out of tune. First, you have to remove the chords one by one and clean the entire neck sides and surfaces. Removing dust and impurities will help with the better gluing of the frets and the smooth sanding of the fretboard. After removing the chords and cleaning the neck, carefully remove the old frets with a tool in a delicate manner, without damaging or chipping the fretboard or enlarging the grooves. Use a soldering iron to press on the frets you want to remove. This heats the fret and melts the dry glue, allowing easy removal without chipping. While pressing with the soldering iron on a side, clamp the fret with the fret remover on the other side and slowly and gradually pull it out. Take your time doing this and don’t drag the fret aside or back and forth, only straight upward. After removing them one by one, clean the grooves with a feeler gauge and a soft piece of paper placed on top. Stick the perfect feeler gauge inside on top of the paper and clean thoroughly. After it’s clean and dry blow the dust off. Flatten and smoothen the rough edges of the fret barbs, so when you run your fingers along the fretboard grooves you don’t feel any indentations or lifted areas. You can use sandpaper to smoothen and even the fretless board. Use very smooth gradients paper to obtain a smooth and soft to the touch fret neck. Using rough paper might leave ugly chaotic marks on it. Now it’s time to place the new frets. Remember, the frets need to be the same in length, thickness, and shape, for uniformity and precision playing. The frets need to be bent to the exact angle of the fret radius. You notice that most guitars have a bent neck board on the sides, not perfectly straight. This helps accommodate the hand when playing chords and not only. Having the right bent angle with help the frets blend well on the surface without pressure, which can make them pop out. Measure carefully and cut the frets, and after bending them to the board radius, apply them with two drops of superglue near their edges. Don’t exaggerate with the glue – this will make a mess on the board, roughen the smoothness or even drip on the neck. Make sure the frets fit well in the grooves and look for raised frets or uneven ones. Holding the neck parallel to the ground at the eye level, check that the neck, fretboard and the frets are arranged on even height and level nicely on the fretboard surface. File the edges of the frets for smoothness and evenness. This will give the guitar a finished look, and avoid hooking the chords while allowing smooth hand navigation. The edges need to be flush at the level of the fret edge and filed at about 90-degree angle with the board plane. The lines of the grooves have to remain the same. Making them larger, uneven or slightly unparalleled to each other will affect your guitar sounds and playing in a bad way. A pair of nail puller pliers should do the job. Remember, whatever tool you use, do it slowly and delicate. Hastening or applying too much force might damage the fretboard. After you mounted and glued the new frets with refined edges, you can smoothen and even any unleveled frets, but first you have to let the glue dry and securely tighten the frets to the board. Several hours or one day should be enough, although it’s best you wait a full day, just to be sure. Only after that you can put the cords on and tune the guitar. You can start strumming, jamming and test playing, to check if the guitar sounds good, without fret buzz, dead notes or out of tune. In order to check and identify any problem, you can start playing the finger exercises you learned when you started playing the guitar. Test each fret on every chord. If you find something wrong, repeat the process of refretting. And that’s it, you’ve refretted a guitar yourself! Remember to act with care, caution, patience and focus. Hasting through this, or doing shortcuts might damage the neck of the guitar. If you follow this advice, you will minimize the risk of doing any damage while doing a great job refretting the guitar. 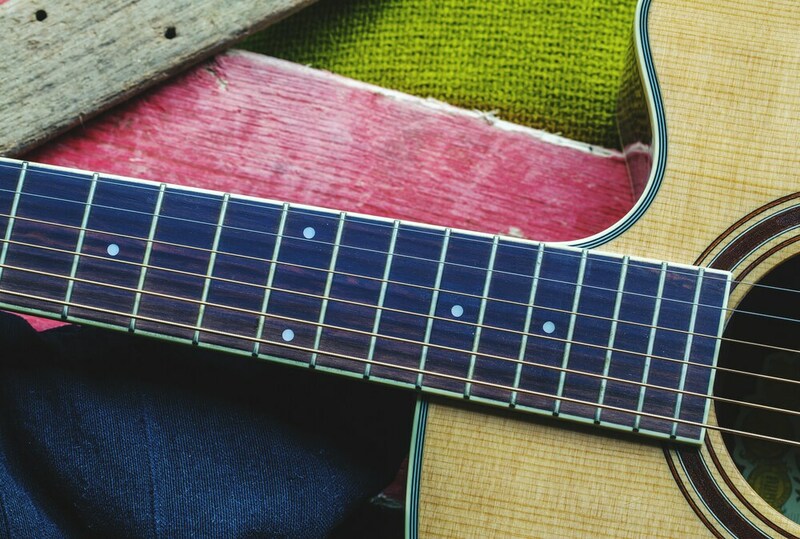 Enjoy the clear, crisp intonated guitar with the new frets and proper calibration. Previous Post How To Refret a Guitar By Yourself at Home – A Simple and Easy Guide for The Average Guitarist Next Post Rosewood vs Maple Fretboard – What Type of Guitar Neck Should I Choose?